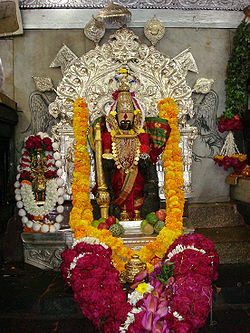 One of the main tourist attraction and pilgrim place of Kolhapur is Mahalaxmi Temple. Puranas say that Mahalaxmi got angered by the action of Lord Vishnu apologising to a sage who kicked The Lord on His chest, where Mahalaxmi resided. Out of anguish She decided to reside in Kolhapur, then called Karveer. Kolhapur then was ruled by a demon called Kolashur. Mahalaxmi destroyed the demon and as a last wish of the demon named the city as Kolhapur. History states the the temple inherits its architecture from Chalukyas in the 7th century CE. The temple is built in black stone with carvings on each and every pillar. It is said that the pilgrim to Tirupati Balaji is not complete unless one visits Mahalaxmi. It is one of the Six Shakti Peethas of India and it has been told that one can get their wishes fulfilled just by visiting the place. There are many small temples of gods in and around the main temple which are Navagraha, Vitthal Rukmini, Ganesh, Kartikeya to name a few. The number of devotees to the temple is ascending year after year. People come from all over the country to see the grandure of 3 feet tall statue of the Goddess which is decorated with jewels and flowers. Kolhapurians are lucky that they are constantly living under the blessings of Goddess Mahalaxmi. Mahalaxmi i have been there so many times, inside as well.